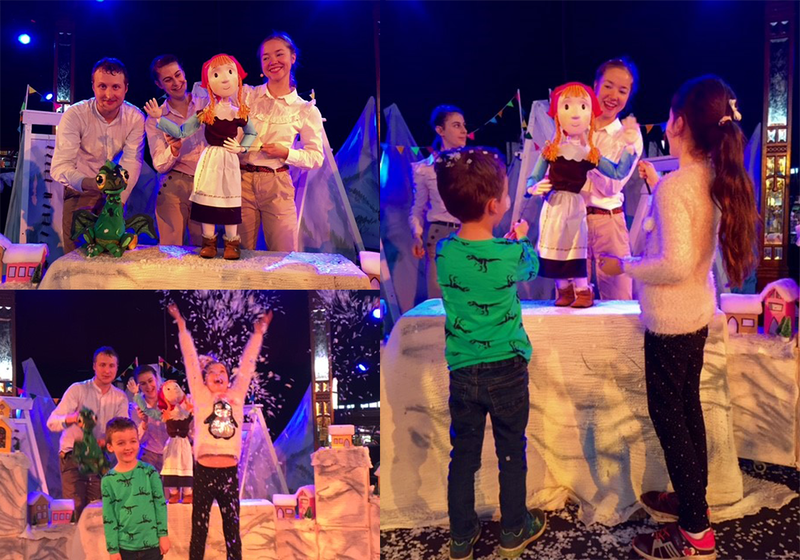 Transforming the Spiegeltent at London’s Winterville on Clapham Common into a Swiss Mountain Village, Skewbald created an atmospheric backdrop for the wonderfully Christmassy tale with a charming wintry set. Offering a relaxed and informal environment, the setting was perfect for little ones and families alike to relax and enjoy the show. Running up to the front, the children sat with other little ones on the lovely rugs, the adults nestled into the comfy seats and the show began. Telling the tale of Mimi – a lonely but loved mountain girl who finds a baby dragon in her woodshed and who embarks on an epic adventure – this poignant, funny and heart-warming tale had all the children captivated from the start. Featuring original and catchy songs, the show was an interactive experience that really engaged the audience of children (and adults!) from babes in arms and up. The very talented and accomplished cast of three effortlessly managed the beautiful puppets, set changes and storyline to really do justice to this wonderful tale. When the show finished, the children were invited to meet Mimi, the baby Dragon and the Mummy Dragon which was very well received and each child was given a little Yoyo snack too on leaving, which was a lovely touch. Thank you so much Skewbald Theatre, we would love to come to your next production and look forward to seeing your new shows in 2018! We then entered the world of Winterville, just outside the Spiegeltent’s door, with Backyard Cinema’s cosy winter wonderland, an ice-skating rink, lots of fun fairground rides, delicious eateries and drinkeries and so much more! A fabulous family day out.